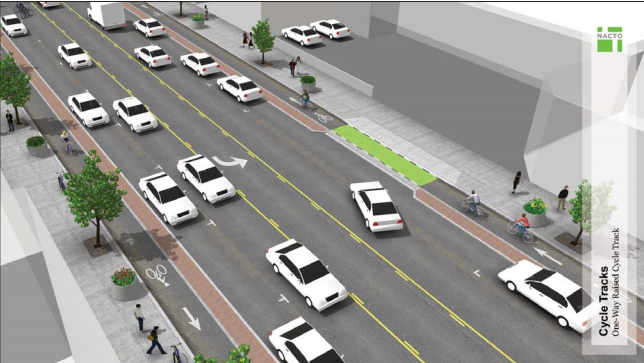 Tonight, the Oakland City Council will vote on a major redesign of Telegraph Avenue, which includes a proposal for the city's first-ever protected bike lane. The plan to renovate the busy Oakland thoroughfare is the culmination of months of debate and public comment, and the final version on the table today is one that East Bay bike advocates say will make the avenue significantly more friendly to cyclists. The plan involves removing one travel lane on Telegraph Avenue in both directions between 19th and 41st streets in an effort to make the roads safer for bikes and pedestrians. 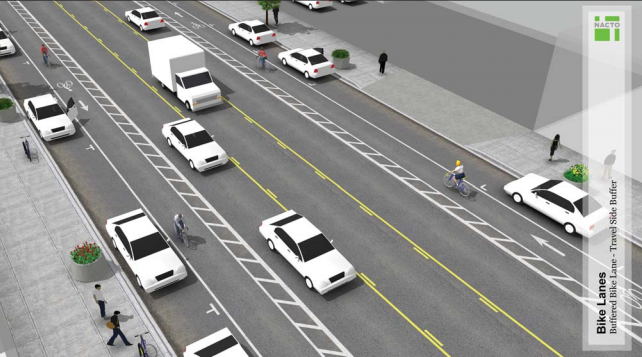 From 20th to 29th streets, the city plans to install "parking-protected bicycle lanes," meaning a bike lane adjacent to the sidewalk and physically separated from motor traffic by a parking lane. From 29th to 41st streets, the city plans to install "buffered bicycle lanes," which are standard bike lanes with additional roadway striping (or a "buffer") separating bikes from traffic. The plan calls for further study and analysis of 40th to 55th streets, a busy corridor that sparked debate earlier this year. Originally, the city suggested simply adding shared lane markings (known as "sharrows") to that section, indicating that motorists should share the road with cyclists. 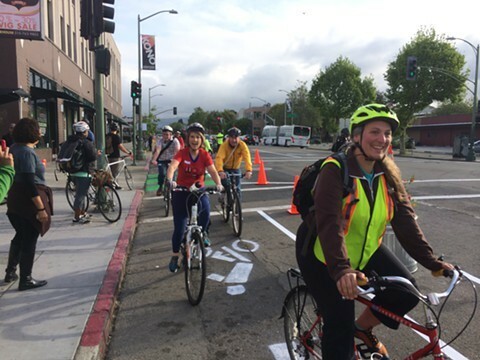 Advocates, led by Bike East Bay, have pushed for continuous bike lanes on Telegraph, instead of a redesign that forces cyclists to weave in and out of traffic. The proposal going before council tonight is more bike-friendly than the initial concept the city released in September. At that time, the redesign did not include any protected bike lanes and only called for buffered bike lanes that would disappear from from 46th to 52nd streets. The new version includes buffered lanes, but adds in the city's first ever protected lane — though only for a ten-block stretch. The design leaves the northern section of the area open for further review in a later phase of the redesign. "This is a good first step," said Dave Campbell, advocacy director for Bike East Bay. "If city council approves phase one, Oakland enters the era ... of creating facilities where cyclists ride separate from traffic." The protected bike lanes from 20th to 29th streets, which the city would implement in the spring, would help demonstrate to Oakland officials and residents that this type of infrastructure can make a big difference in encouraging safe cycling, advocates said. "This is right in the heart of urban Oakland. That's why it's so important," said Campbell. City Public Works officials have said that if the protected lanes prove to be successful, the city will explore opportunities to extend them north. Renee Rivera, Bike East Bay's executive director, on Telegraph Avenue. Existing research suggests that this type of redesign carries a number of benefits — and not just for cyclists. Studies in cities across the country have illustrated that bike lanes — especially protected ones, which attract a wide range of cyclists, not just experienced riders — can offer a substantial boost to retail business by encouraging more frequent shoppers. Even without any bike lanes, Telegraph Avenue currently sees more than 1,200 cyclists a day, according to the city's own research. With new bike lanes, that number would likely rise significantly, which could only help the surrounding retailers and restaurants in Temescal. Today, a group of researchers from UC Berkeley's Department of City and Regional Planning's transportation studio completed a report that, in part, looks at some relevant transportation trends in North Oakland and around the MacArthur BART station. 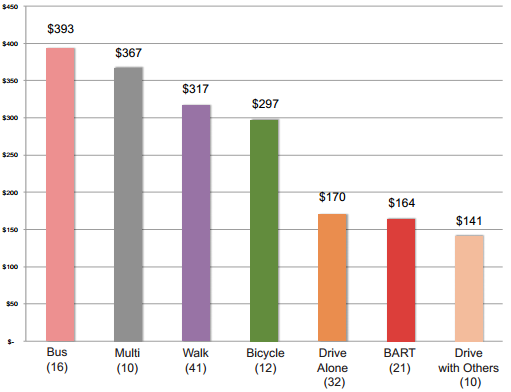 From a presentation the group sent me this morning, a survey of nearly 200 residents near MacArthur BART found that 79 percent of people have bikes, and that people walk or bike for a quarter of all trips. Interestingly, in a section on merchants' perceptions, the research found that 87 percent of merchants surveyed said they believe a majority of their customers drive. In reality, only 32 percent of shoppers said they usually drive to Temescal. Ten percent of shoppers said they usually biked, 23 percent said they usually took the bus or BART, and 25 percent said they usually walked. The research team plans to publish a full report online later this week. You can read more about the city's full redesign concept in its final plan (PDF); details on the bike lane proposals start on page thirty. And here is the official report and ordinance that council is reviewing at tonight's meeting, which starts at 5:30 p.m.